King Crimson burst onto the scene in October 1969, with their debut album In The Court Of The Crimson King. A prog rock classic, it reached number five in the UK and was certified gold in America, when it reached number twenty-eight. Following the success of In The Court Of Crimson in America, King Crimson headed on their first American tour. On their return home, King Crimson lost two members Ian McDonald and Michael Giles. This was the first of numerous lineup changes in the history of King Crimson. The next member of the band to exit stage left was Greg Lake. He’d been approached by Keith Emerson to join what became Emerson, Lake and Palmer. Having lost three members of the band, Robert Fripp was left as the only member of King Crimson. This presented a problem, King Crimson had an album to record. So former members, Peter and Michael Giles returned to play bass and drums, while Keith Tippett played piano. Robert played keyboards and guitars, while session musicians augmented the band’s lineup. Without a lead singer, an unknown singer Elton John nearly became the lead singer. Instead, Greg Lake sang the lead vocals. This proved a winning formula. On its release in May 1970, In The Wake Of Poseidon reached number four in the UK and number thirty-one in America. In The Wake Of Poseidon would prove to be King Crimson’s most successful album, during a five year period where King Crimson were one of the most successful prog rock bands. The album that close this golden period was Panegyric. Before I tell you about Red, I’ll tell you about the remainder of what was the most successful period in King Crimson’s long and illustrious career. Following the success of In The Wake Of Poseidon, King Crimson released their third album seven months later. Again, King Crimson’s lineup seemed to be constantly evolving. Jazz pianist Keith Trippett and flautist and saxophonist Mel Collins returned. They were joined by drummer Andy McCulloch and Yes’ frontman Jon Anderson. Lizard, which was produced by Robert Fripp and Peter Sinfield was a much more jazz oriented album. Despite its undoubtable quality, Lizard stalled at a disappointing number twenty-six in the UK and number 113 in the US Billboard 200. Equally disappointing was that this lineup of King Crimson never got the opportunity to tour. Having released two albums in seven months, it was another year before King Crimson released their fourth album, Islands. Islands marked the end of era for several reason. The first was that Islands was the last album to feature Peter Sinfield’s lyrics. This was the last album to feature what was King Crimson’s trademark fusion of progressive and symphonic sounds. Again there were changes in lineup. Boz Burrell played bass and sang lead vocals, while Ian Wallace played drums and percussion. On the release of Islands, the album divided opinion. Some critics felt that Islands didn’t match the quality of King Crimson’s three previous albums. Despite this, Islands, which was released in December 1971, reached number thirty in the UK and number seventy-six in the US Billboard 200. Then there was the controversy surrounding Ladies Of The Road. King Crimson found themselves in the midst of a controversy where they were accused of misogyny. For King Crimson this was a disappointing way to end an era. For what was their fifth album Larks’ Tongues In Aspic, this marked the debut of the third lineup of King Crimson. Joining Robert Fripp were bassist John Wetton, ex-Yes drummer Bill Bruford, percussionist Jamie Muir and David Cross, who played violin, viola, Mellotron, electric piano and flute. This new lineup saw the band head in a new direction. King Crimson incorporated different instruments, including percussion and African mbiras. They moved away from their jazz sound, to a fusion of prog rock and experimental music on what became Larks’ Tongues In Aspic. It was released in March 1973, to critical acclaim, reaching number twenty in the UK and number sixty-one in the US Billboard 200. With a new lineup and having released their strongest album in recent years, King Crimson looked as if they were about to become one of the biggest bands of the early seventies. Just about every prog rock band released a concept album. Starless and Bible Black, which is a quotation from the first two lines of Dylan Thomas’ Under Milk Wood, was King Crimson’s concept album. The album is a commentary on the sleaziness and materialism that was blighting society. Richard Palmer-James, a former member of Supertramp, cowrote four of the songs on Starless and Bible, which saw King Crimson take a different approach to recording. Unlike previous albums, there’s no drums on Starless and Bible. Despite the lack of drums, drummer Bill Bruford played percussion and cowrote three tracks. While he played on Starless and Bible, Jamie Muir didn’t. He’d left the band. Another change was that only the first two tracks on Starless and Bible, The Great Deceiver and Lament recorded in the studio. The rest of the tracks were recorded live, with the applause edited out. This was a very different approach from previous King Crimson albums. Despite this, Starless and Bible Black was well received. Some critics hailed Starless and Bible Black as King Crimson’s best album since their debut. With its fusion of prog rock and experimental music, it was an ambitious and groundbreaking album. On its release in March 1974, it reached number twenty-eight in the UK and number sixty-six in the US Billboard 200. With King Crimson having released two consecutive critically acclaimed albums, it looked as if they were about to join the royalty that included Pink Floyd and Led Zeppelin. However, that wasn’t to be. Having released to consecutive critically acclaimed albums, 1973s Larks’ Tongues In Aspic and then Starless and Bible Black, critics and fans wondered what direction King Crimson seventh album Red would take? Being King Crimson, fans and critics had learnt to expect the unexpected. The first change was in the lineup. After their 1974 summer tour, David Cross left King Crimson. This meant the band was now a trio consisting of Robert Fripp, bassist John Wetton and drummer Bill Bruford. They cowrote much of Red. Red featured just five tracks. The title-track was penned by Robert Fripp. He and John Wetton penned One More Red Nightmare. They the cowrote Fallen Angel with Richard Palmer-James. Province and Starless were written by King Crimson with former violinist David Cross. These five tracks became Red. Recording of Red began on 30th June 1974 at Olympic Studios, London and finished in August 1974. Four of the songs on Red were recorded live. The exception was One More Red Nightmare, which was recorded live. In the studio, Robert Fripp played guitar and mellotron. He was joined by bassist John Wetton and drummer Bill Bruford. They were augmented by a variety of musicians who often, played on just one track. This included violinist David Cross, soprano saxophonist Mel Collins, alto saxophonist Ian McDonald, Robin Miler on oboe and Mark Charig on cornet and bass cello. These musicians played their part in not only what’s a landmark album, but an album that marked the end of an era. On its release in October 1974, Red reached just number forty-five in the UK and number sixty-six in the US Billboard 200. Critics hailed Red as an innovative album. There are obvious similarities with Larks’ Tongues In Aspic and Starless and Bible Black in sound and quality. One change was the lack of the acoustic guitars that featured on previous albums. With its fusion of prog rock and classic music, Red proved to be a hugely influential and innovative album. I’ll now tell you why. Opening Red is the title-track. It’s one of the reasons why Red was chosen by Q magazine as one of the fifty heaviest albums of all time. The trio of Robert Fripp on guitar, bassist John Wetton and drummer Bill Bruford give a masterclass in hard rock. A hard driving tracks, Robert’s guitar is at the heart of the action. It’s over-dubbed, so that it sounds as if you’re being assailed by a wall of searing, scorching, driving guitars. Meanwhile, John and Bill power the arrangement along. Seamlessly, King Crimson switch between time-signatures. From 4/4 they take detours via 5/8 and 7/8. This allows King Crimson to indulge in some musical showboating, as they demonstrate why they were one of the most talented and versatile bands in the history of prog rock. Eerie, moody, discordant and melancholy describes the introduction to Fallen Angel. It has a much more understated sound. John’s vocal is accompanied by strings and a thoughtful, spacious rhythm section sounding not unlike Pink Floyd. Partly, that’s down to the harmonies that accompany the vocal. Then as the drama and emotion increases, King Crimson kick loose. The track takes on harder, rockier sound. That’s down to the rhythm section and screaming, soaring guitars. Sometimes, it heads briefly in the direction of free jazz. That’s not surprising, given King Crimson’s background. From that dramatic high, the arrangement takes on a more thoughtful understated sound. Keyboards and guitars take centre-stage, as the track takes on a melancholy, sometimes, sci-fi sound, before the rhythm section and harmonies and horns drive the arrangement to a dramatic crescendo. One More Red Nightmare has a dramatic, moody, and almost disturbing sound. One thing’s obvious though, and that’s how good King Crimson. Although their just a trio, they’re a multitalented trio, who seem to relish the opportunity to showcase their inconsiderable skills. Having set the scene, John’s vocal matches the drama of the rocky arrangement. Swathes of driving, gnarled, guitars add to the drama. Then just as you least expect it, the tempo drops. From there, King Crimson toy with you. The arrangement veers between dramatic, disturbing and jazz-tinged, thanks to Ian McDonald’s alto saxophone. He unleashes a blistering solo, which seems to drive the rest of the band to even greater heights. They surpass everything that’s gone before, fusing prog rock, blues and jazz seamless to create a blistering, genre-melting opus. David Cross’ wistful violin opens Providence. It constantly threatens to reach a discordant. That never quite happens. Despite that, you’re always wary, wondering what direction this experimental sounding track is heading. Bursts of percussion and scorching electric guitar threaten to interrupt the strings. For over three minutes the track threatens to explode. There’s everything from pizzicato strings, percussion and searing guitars thrown into the mix. With three minutes of this eight-minute epic left, free jazz, experimental and rock are combined by King Crimson. It sounds as if they’re jamming, experimenting and trying to play their way into the track. Having found an in, Robert’s guitars are at the heart of what becomes an innovative and explosive fusion of experimental, rock and free jazz. Starless a near thirteen-minute epic closes Red, and would be their swan-song for seven years. Fittingly, there’s a gloriously wistful, melancholy sound. The arrangement is thoughtful and understated. So too is John’s heartfelt, pensive vocal. Behind him swathes of strings, woodwind and the rhythm section combine. They ensure they never overpower his vocal. Instead, it’s a case of complimenting his vocal, which is the best on the album. Similarly, Robert’s guitar playing is neither as power, nor aggressive. This allows you to hear another side to his playing. Then after four minutes, the arrangement is pared back. Just chiming guitars and a broody bass join shrill strings. Gradually, the arrangement unfolds, taking on a rockier sound. As the song progresses, King Crimson are at their heaviest. Powered along by machine gun guitars and a powerhouse of a rhythm section, lush strings sweep in. The rocky sound melts into King Crimson’s symphonic sound, as two side of the band become one, Given what was about to happen, this would prove fitting. Following the release of Red, Robert Fripp called time on King Crimson. It was always meant to be temporarily, but lasted seven years. By the time King Crimson returned with Discipline in 1981, music had changed. So had King Crimson. They were now a quartet, but only Robert Fripp and Bill Bruford remained. This was just the latest change in King Crimson’s lineup. 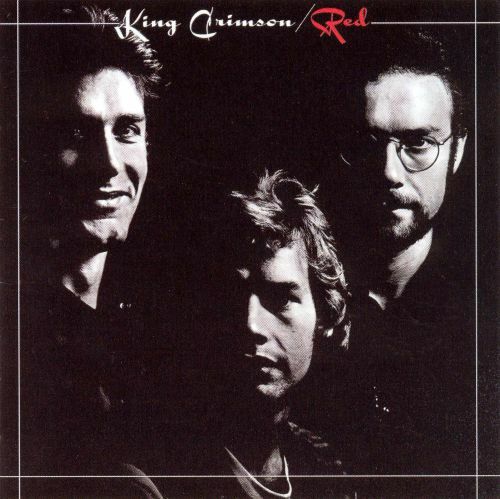 It was a very different lineup of King Crimson that featured on Red that featured on their debut album In The Court Of Crimson. Although the lineups were different, they both had one thing in common, their quality. Red marked the end of a five year period when King Crimson were one of the most innovative, influential successful prog rock bands. The newly rereleased version of Red which was recently rereleased by Panegyric, is a double-album. Disc one features Robert Fripp and Simon Heyworth’s 2000 remastered version and two bonus track. Then on disc two, there’s the 2013 stereo mix of Red, plus two bonus tracks. Having listened to both discs, the sound quality on both is exquisite and which you prefer will be down to personal preference. That Red has been given this sonic makeover is fitting. After all, Red marked the end of an era for King Crimson. They’d released seven albums in a five year period. These seven albums saw King Crimson at their very best. They never bettered this run of innovative, influential and groundbreaking albums. It began with In The Court Of Crimson and finished with Red. Remarkably, throughout this period, King Crimson’s lineup was constantly changing so often that the studio should’ve had a revolving door. Maybe this is part of King Crimson’s success. With a constantly changing lineup, the new personnel brought new with them new and fresh ideas. That was the case with Red. The new lineup ensured King Crimson’s music never became stale or predictable. Robert Fripp made sure of that. After their seventh album in five years, Robert called time on King Crimson. They’d never stand accused of being dinosaurs. Instead, they were innovators, whose music influenced future generations. Starting with In The Court Of Crimson and finishing with Red, King Crimson were responsible for innovative, genre-melting music that pushed musical boundaries to their limits. ← PERU MARAVILLOSO: VINTAGE LATIN, TROPICAL AND CUMBIA.